Arbruster's essay is published in the collection, "On Active Grounds." 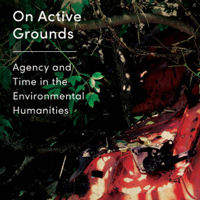 "Active Grounds” considers the themes of agency and time through the burgeoning, interdisciplinary field of the environmental humanities. Fourteen essays and a photo album cover topics such as environmental practices and history, temporal literacy, graphic novels, ecocinema, ecomusicology, animal studies, Indigeneity, wolf reintroduction, environmental history, green conservatism, and social-ecological systems change. Armbruster is professor of English in the College of Arts & Sciences and chair of the Sustainability Studies Committee. Andrea Rothbart delivered the keynote address, “Arithmetic and Algebra on Clocks,” at a convention for community college mathematics teachers in Kansas City. The Missouri Mathematical Association of Two Year Colleges (MOMATYC) conference took place April 2-6. Rothbart is professor and director of the MA in Mathematics for Educators program in the School of Education. She develops graduate level mathematical curriculum for use with secondary/community college math teachers in courses in Number Theory, Discrete Mathematics, Analysis, Logic, Probability, Vector Geometry, Problem Solving Strategies and Algebraic Structures. Also, for many years, she has helped create the national examinations given by the Mathematical Association of America to bright high school students. 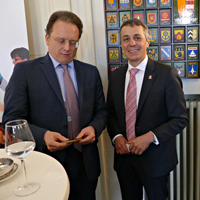 Oreste Foppiani, head of the Department of International Relations at Webster University Geneva, participated in a business meeting and luncheon with the Swiss Federal Councilor Ignazio Cassis. The latter is currently the Head of the Federal Department of Foreign Affairs. The event was organized by the Italian Chamber of Commerce in Switzerland at the Belvoir Park Restaurant in Zurich, where about 70 persons attended the event. Among the many noteworthy points touched by the Swiss Secretary of State, there were the EU-Swiss relations and the European political crisis as well as the exit of Great Britain from the Union. Foppiani invited Cassis as a keynote speaker to the 25th International Humanitarian & Security Conference, which will take place at the CICG (www.cicg.ch) on March 19-20, 2020. 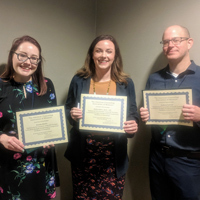 Second-year MA in Counseling students Brooke Blythe and Andy Conrad presented with Molly Stehn, assistant professor of Counseling, at the American Counseling Association of Missouri annual conference in Kansas City this past weekend. The presentation was entitled, "Dialectics and the counselor: Using DBT principles to mindfully navigate interpersonal and intrapersonal paradoxes in counseling." The presentation addressed how counselors of a wide variety of theoretical orientations could incorporate theoretical concepts from dialectical behavior therapy into their work with clients. Stehn is assistant professor and director of assessment in the Department of Professional Counseling, in Webster's College of Arts & Sciences.